IRON SAVIOR - THE LANDING LTD. EDIT. (DIGI) | Online Shop | Wizard LTD. Album: "THE LANDING LTD. EDIT. 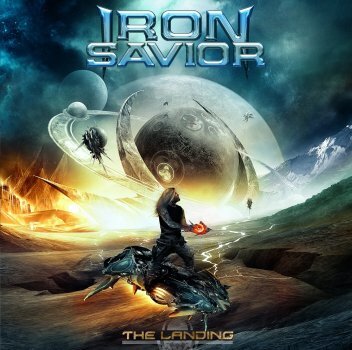 (DIGI)"
With "The Landing" one of the most popular German metal bands finally returns back to the scene: IRON SAVIOR! Their performance is impressive: "The Landing" is full of haunting melodies and power - all in the typical Savior sound. Hymns like "Heavy Metal Never Dies" and "Hall Of The Heroes" posses an almost unreal power of persuasion, with "Starlight" melodic speed to perfection is represented, the beautiful half-ballad "Before The Pain" captivates with atmospheric density and straight forward rockers like "R.U. Ready" or “No Guts No Glory” will make it hard for anybody to sit still. With "The Landing" IRON SAVIOR have probably recorded their most versatile album to date, and it is still 100% IRON SAVIOR. Development takes place with the band in detail and the fan always knows that he is perfectly served. "The Landing" was, like his previous albums, recorded at Piet Sielck&apos;s Powerhouse studio.